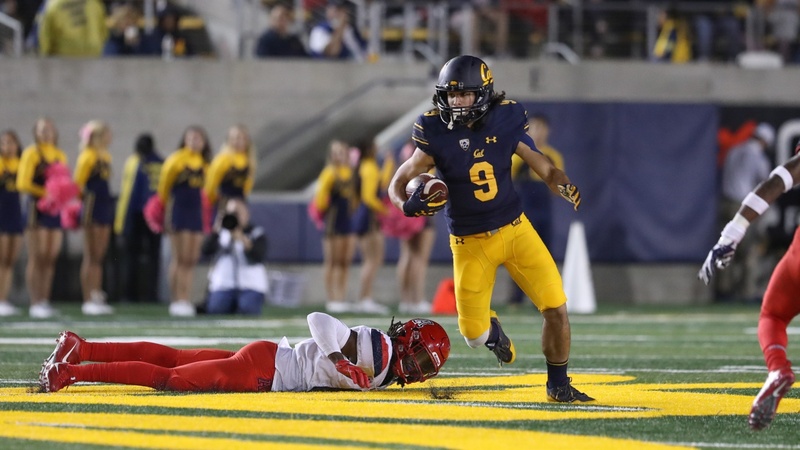 About the time Cal fans started paying attention to Kanawai Noa last year, so did opposing defenses. Noa, a redshirt sophomore in 2017, came back from an injury shortened 2016 season to become one of the top targets for quarterback Ross Bowers. He was particularly effective on third down and it didn't take defenses long to figure that out. "Every now and then and third and long I noticed a linebacker inside, a nickel back outside and a safety over the top hovering," Noa said in a recent interview. " I noticed that and then there was a lot of two man (coverage)." And why wouldn't the other team want to see that the 6-0, 185-pounder from Hawaii had plenty of company? He caught 56 passes for 788 yards and four touchdowns. He also did his best work when it mattered most, twenty of his receptions came on third down. "He's a fearless guy, he's a clutch guy," head coach Justin Wilcox said. "It seems like when you need it the most he shows up. That is great quality to have. That is just part of his DNA. "We try to put him in spots where we can maybe isolate him. The defense does things to take away certain people. And there is that comfort level for the quarterback with a guy like that who's proven it on third down, or any down, he can come up with a big play. He's done that for us." Wide receivers coach Nicholas Edwards has been watching Noa work his magic since the receivers' high school days in Honolulu. "He has great hands, he has a natural feel from the slot position to go find space, find zones." Edwards said. "He is a very intelligent receiver on top of that. "He can, go into the seam, he can hop outside and he run go balls, he can run corners, he can run every route in the book." Edwards said he could tell from the time he first saw Noa running pass patterns that the young man was special. "He just kind of jumped out at you," Edwards said. "The way he ran routes, then once you start talking to him, you realize he really knows routes, he knows coverages." An assistant at Houston at the time, Edwards tried to lure Noa down to Texas. "He had our offer, he got a Washington State offer, he got a Cal offer," Edwards said. "Then he took the Cal offer. ... Now I am glad he did." If there has been a negative to Noa's career it has been the injuries. After playing as reserve and on special teams in 2015, he was limited to three games the next year. Last season he was healthy for all but one game and along with VIc Wharton III was part of one of the more productive receiving tandems in the nation. They combined for 123 catches good for 1,659 yards and nine touchdowns. Noa's contribution was 56 receptions, 788 yards and four touchdowns. But during the spring he was out again, did not return to unrestricted duty until Fall Camp was well underway. "It was hard, especially watching practice," Noa said. "It was strange in the spring and the beginning of Fall Camp just to watch. But it also helped me learn other aspects of the game that I didn't go into as much depth, coverages, defensive schemes, o-line blocking. I was feeling more of the quarterback role, even though I wasn't in there." But Noa is back full go and getting ready for North Carolina on Saturday. He feels the Bears' passing game, as productive as it was last year, is destined for bigger things this season. "From last year to now is almost night and day," he said. "Coming off the first year of a new system for everybody, there is a whole different vibe from last year to this. Everybody knows what to do, what to expect, what the coach wants, and also we have depth. I think our receiving corps is further along from what it was last year." Besides being aware of what they should be doing, Noa said the receivers also have a better idea of what quarterback Ross Bowers might be up to on any given play and they can react accordingly. "I think the timing is getting there," Noa said. "Also being able to compensate and adjust to how we see things is a lot better. Being able to understand each other better, and get on the same page. Being open-minded. I think it's a lot different from last year to this year." Noa, who is on the watch list for the Polynesian College Football Player of the Year, had an outstanding career at Punahou High School in Honolulu. Berkeley is a long way from there, and not just in miles. "It is definitely different. It is a change of scenery," he said. "I think Berkeley is a unique place overall. ... But academically and athletically it is everything I hoped for. The football we haven't won enough games, but we expect to have a great season this year." He does confess to being a little homesick occasionally. His visits to the Islands have been infrequent. "I try to go after the season and in the summer time," he said. "But it's been very rarely. Football is pretty much around the clock. I definitely miss home." He plans to graduate in June with a degree in sociology. "I am not sure what I want to do," he said. "I am leaning towards counseling or some type of social work." But first there are pass patterns to be run.
."He's a great competitor, he doesn't say a lot. But he plays fearless," Wilcox said. "He will run any route, guys have a lot of respect for him because of that."